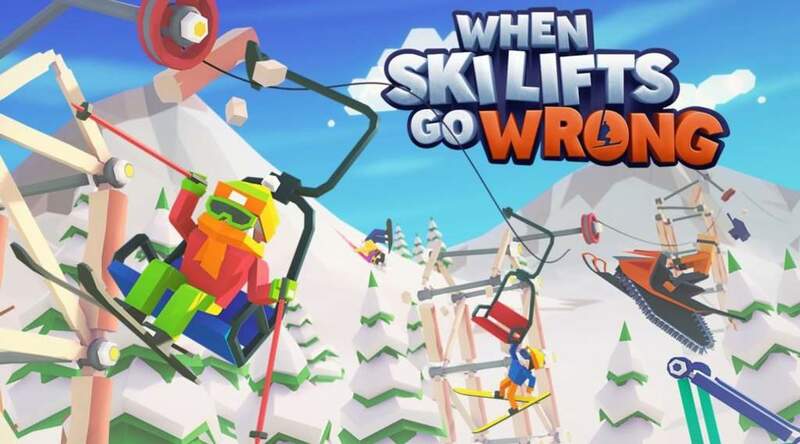 Curve Digital ha rivelato l’arrivo di Ski Lifts Go Wrong, titolo disponibile nei prossimi mesi sui Nintendo Switch europei. Il titolo simulativo di Hugecalf Studios sarà infatti pubblicato nei primi mesi del 2019 sull’eShop europeo e americano di Nintendo Switch. Potete trovare l’annuncio ufficiale in calce all’articolo. Realistic physics means realistic disasters! London, Thursday 8th November – Curve Digital and Hugecalf Studios have partnered up to lift low-poly physics puzzler, When Ski Lifts Go Wrong, out of Steam Early Access and send it skidding onto Nintendo Switch™ in early 2019. When Ski Lifts Go Wrong mixes construction with destruction, sending hapless skiers, boarders and snowmobiles across perilous courses, and sometimes to their deaths. When Ski Lifts Go Wrong is an evolution of the title previously known as ‘Carried Away’. Curve Digital has changed the name in preparation for the full launch early next year, which will see more stages and new vehicles. There’ve been a number of improvements since the successful Early Access began, such as a complete UI overhaul, players having more control over the riders and extra buckets of polygonal blood (look, it’s a square bucket, okay?). Even more features are planned for the final Nintendo Switch™ and PC launch early next year. The game, due to be released commercially on PC and Switch in early 2019, challenges players to build ski lifts to transport eager skiers from one side of the mountain to the other, then wince as the results of their haphazard constructions are revealed in a full 3D simulation where skiers tumble out of chairs and land face first in the snow. Realistic physics means realistic disasters. This is a game about enjoying each failure, as madcap physics and bloody mishaps make every run feel fresh. You must construct ski-themed courses – rigging chair lifts, gondolas, and ramps – and use direct control to get your skiers and snowmobile drivers to the finish line without them tumbling down a ravine. Or depending on how you feel, purposely send them tumbling down a ravine. The icy physics builder enjoyed a warm reception on Steam Early Access, managing a ‘Very Positive” rating for its pre-V1.0 reviews. The developers at Hugecalf are now completing the construction, adding the finishing touches, upping the death count, and laying down solid foundations for the final, transformed release in early 2019. Curve Digital is one of the world’s leading publishers of games on PC and consoles. Since 2013, the company has been working with some of the world’s best game developers to help bring their games – from indie hits like Dear Esther to the likes of the million-selling Human: Fall Flat – to the broadest possible audiences all over the world. In 2017 Curve Digital was recognised by the celebrated Develop Industry Excellence Awards as ‘Publishing Hero’ and in 2018 was crowned the ‘Indie Games Publisher of the Year’ at the MCV Awards. Most recently, Curve Digital was shortlisted for the ‘Publishing Hero’ at the 2018 Develop Industry Excellence Awards.